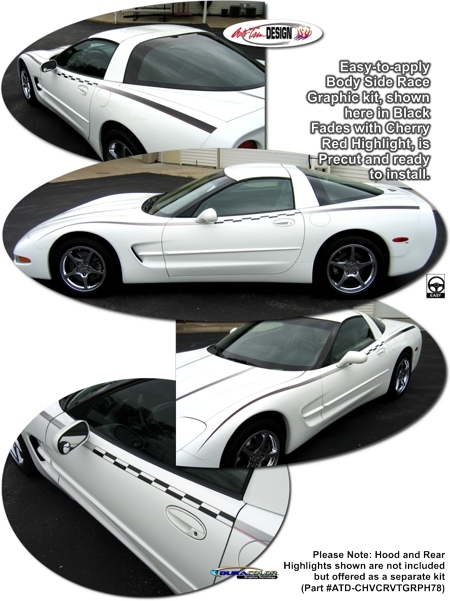 Enhance and highlight the attractive body side lines of your Chevrolet Corvette C5 with this simple and unique graphic kit that starts as solid and fades to your vehicle's paint scheme in the center with a Checker Flag design as shown. Available in four (4) fade colors with highlighting pin, this kit is very easy to install (requires slight trimming at Fuel Door during application) . Kit is specifically fit for the '97-'04 Chevrolet C5 Corvette (Coupe, Convertible or Z06) and will not fit any other vehicle.